Samsung Galaxy Note 7 is once again in the news for catching fire. This time it is from United states of America and the flight evacuated. Earlier we posted about Samsung galaxy Note 7 explosion cases reported – Worse than expected. This was a known issue and Samsung recalled all the devices in the market and replaced with a device which will have a better battery. The battery icon on the lock screen will be green for the replaced devices to mark it as safe. 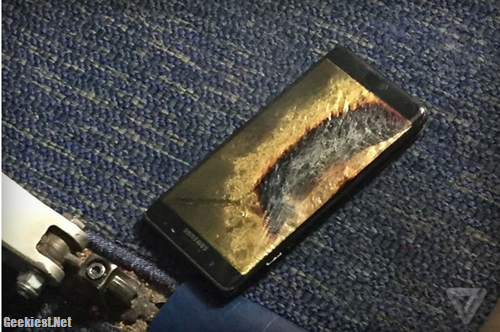 But the latest issue reported from USA, a replacement Samsung Galaxy Note 7 caught fire on a Southwest Airline (flight 994 from Louisville to Baltimore). All the passengers and crew exited the plane and no causalities reported reported The Verge. The phone was in powered down mode and it started smoking from his pocket. Samsung says they will retrieve the device and will study the incident and then only they can confirm the issue is related with the device or not. Federal regulators also will be enquiring this issue. Anyway Samsung Galaxy Note 7 is still in the news for a bad reason. If the issue is not a random one, there will be another recall of the device.